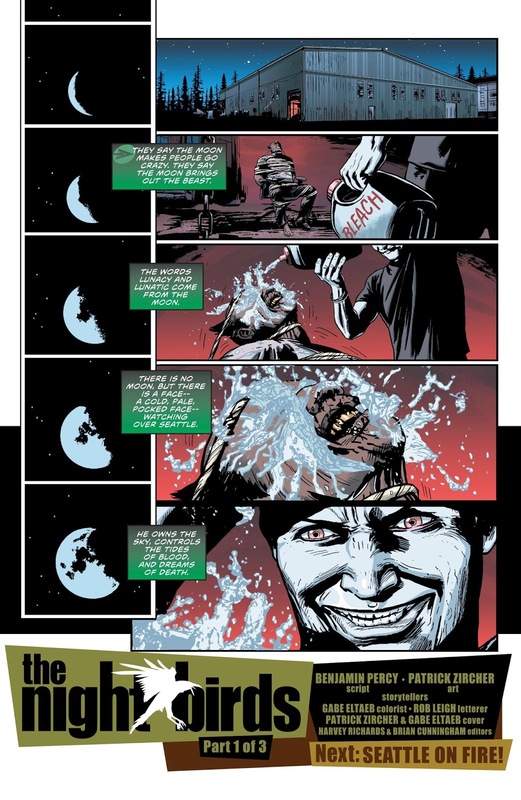 We saw in the Green Arrow sneak peek that after Oliver Queen took down John King in the last story arc, he decided that he needed to find himself and after traveling to Alaska, where he drank booze that a dead man was floating in, which personally sounds like quite a wake up call that the life you're living isn't exactly the best one and thankfully, Oliver decided that too and returned to Seattle to help his sister take on the threats to the city. So now it's a whole new creative team taking on the Emerald Archer, let's see what they have in store for us with this all new direction and look for our hero. Let's check it out. We begin our story with a couple walking the waterfront of Seattle, when much to the guy's apprehension, the girl wants them to take a ride on the Great Wheel....... Apparently, the guy isn't a fan of heights and should have gone with his flight instincts because when they get on and begin turning on the ferris wheel, out of nowhere they are pulled out, one by one and we begin the murder mystery that this story presents. Right away, it comes off that the killer is a vampire because the beginning of this book is very similar to The Lost Boys and I half expected this pale individual seen watching the couple from the crowd to be accompanied by Kiefer Sutherland and Alex Winter. Too bad the Frog Brothers aren't in Seattle, because they know how to deal with night stalkers........... Yeah, this joke only works if you watch The Lost Boys, so get on that. 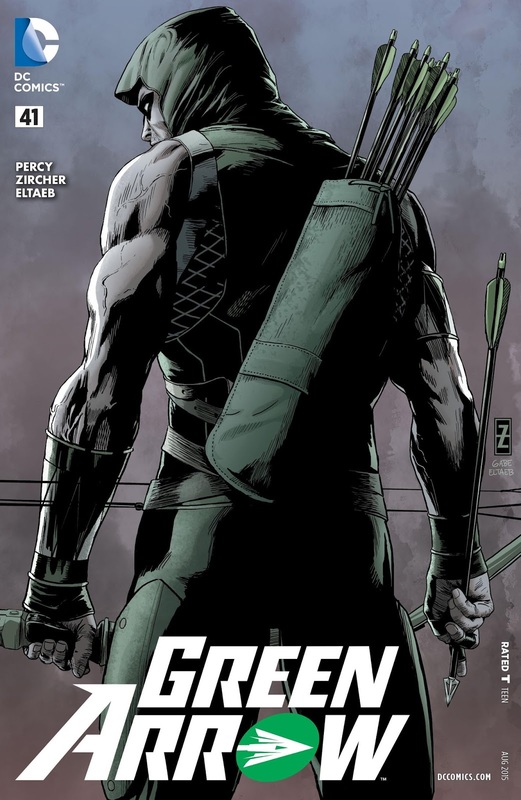 After we get the initial murder, we move into more heroic territory and see what Oliver Queen is up to. Now that he's back home, he's trying to get his life together by running Queen Industries and taking care of his sister Emiko.......... hell, we don't even see him dressed as Green Arrow until the end, it's mostly a whole bunch of foreshadowing about what Oliver will have to deal with in the future, while trying to interweave the main character into the story as best they could. 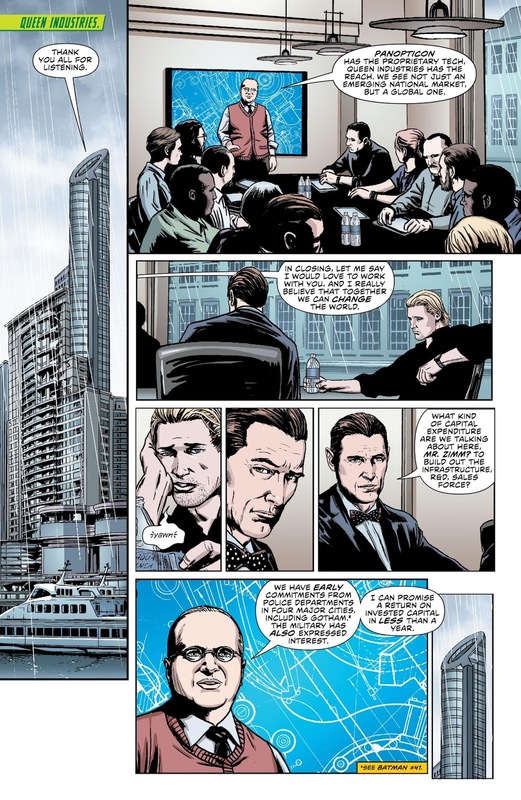 Like the story where a spokesman for a company called Panopticon is proposing a deal with Queen Industries that is pretty ambiguous, Oliver is there just acting bored and preoccupied with the new status quo of his life and the murders taking place in his city. Hopefully he'll get on the trolley soon though because we see that the spokesman, Mr. Zimm gets in a car with our supposed "vampire" killer after the meeting is over. In the end, to get some real answers about what's going on in Seattle, Oliver Queen takes to the streets, but before he could find out what's going on in a district criminally run by a dog fighter, the killer strikes again, pulling PETA's most wanted into the sky, leaving Oliver without answers and him focusing on rescuing a Cujo of a dog. Yeah, I like my heroes to be animal friendly, but there's more pressing issues going on here Oliver. As the issue closes, we see the dog fighter tied to a chair as the pale killer pours bleach over him......... Lousy, racist, possible vampire. That's it for this issue of Green Arrow and as far as this new direction goes, I'm not sure if it's something that I can get into. 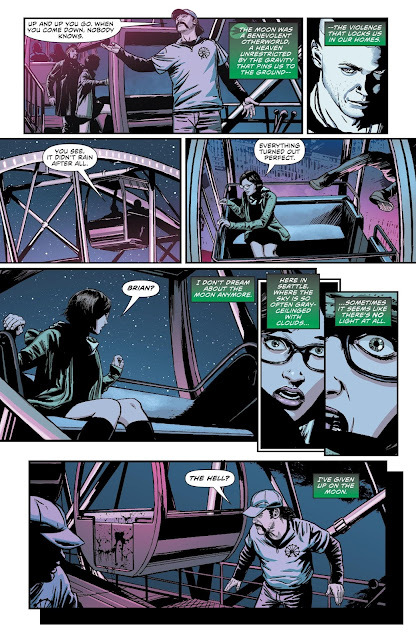 I love horror, but the slow burn of the story really makes for a hard read as we're left without an explanation about what happened to Felicity or Diggle and focus more on strange new characters like a homeless wart covered woman and the corporate nogoodnik Mr. Zimm. I know that people don't want their Green Arrow comic to merely be a reflection of the television show, but what this comic is missing is something that I find crucial to the character and that thing is "fun" and with an entourage of characters to play off of, fun is usually the result. I guess racially motivated possible vampires aren't the path to "yuk yuks", but the character should still reflect who he was before....... at least a little. 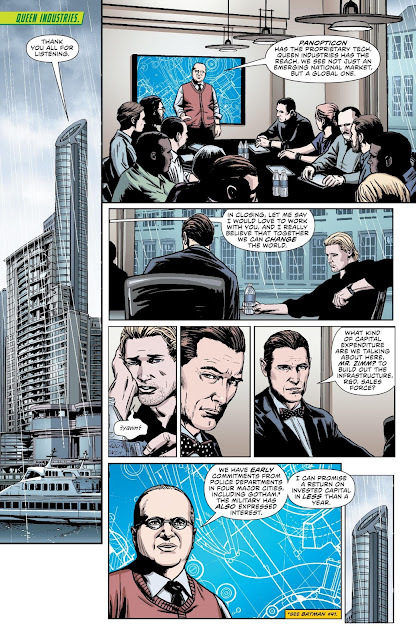 Another thing that the writer seems to be doing here is along the lines of what Scott Snyder does with making Gotham a character, but it seems to work more for me with a fictional city than it does with a city like Seattle. I don't know if it's because Seattle is real that it doesn't come off working as well, but we already know that it rains a lot in Seattle and with that, it's dark because of the clouds, we don't have to spend time hyping the darkness of the city when it's already a known cliche. Hopefully, this story picks up in future issues because right now I'm not that interested and it actually took me three times to get through this book because I kept getting bored. We've got a new creative team and a new direction for Green Arrow, so it's possible that new readers will try and get on board here, but I don't know if it's a place to keep the readership going. This issue is a very slow burn as it takes us through a mysterious murder spree in Seattle and does little except for show us that Seattle is a depressing place to live. I was really bored throughout this issue and only hope that the story picks up from here on out.